Organic. Great taste 2013. World Cheese 2013 Awards - Silver. International Cheese Awards Nanwitch 2015 Est. 1987 - Gold Award 1st in the World. Suitable for vegetarians. 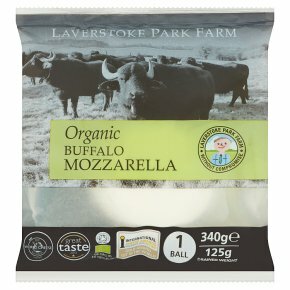 Enjoy our organic mozzarella at room temperature with fresh tomatoes, basil leaves and lots of our lovely light, fruity olive oil sourced and bottled for Laverstoke in Spain. We also enjoy chunks of mozzarella stirred into soups and pasta sauces. We hope you enjoy it as much as we do.